FlashyG had the most liked content! D-Boz tearin 'em up in the D! Switched jobs, moved and don't have enough free time this season. Hopefully once I've been at this place a while I can work from home a little more often so I have time to do some more GDT's and post a little more. Ian White Preparing for War? The Unauthorized possession of a firearm charge means he didn't have a license to carry at all, and the breach of recognizance means that he was already in legal trouble and failed to show up at his court appearance. You also seemed to miss the fact that the gun was a prohibited firearm in Canada which means it was either a handgun with a barrel equal or less than 105mm in length, an adapted rifle or shotgun (ie. A sawed off shot-gun), or an automatic firearm that hasn't been altered to fire only one bullet per trigger pull. Even if your proposed version of events were true, which is unlikely, its pretty stupid to go hunting when: You're not authorized to even carry a gun. The gun you're carrying is illegal	You also have said gun improperly stored	You're already wanted for failure to appear in court and	you have a prior criminal history. There's a reason he was remanded into custody and not just fined and let go, and its not because Canada has a strict criminal justice system. He's in real trouble. I doubt Blashill has any issues with confidence in either of his goalies. They've swapped back and forth for almost every game this season. They also have almost identical numbers. It's a little bit early, but I wont be around at Midnight to post it. Hopefully that's ok. I'll take tomorrows vs San Jose if nobody minds. damn. I wish I had thought of the Hudler face. 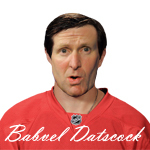 I could've used one to replace Eddie O.
I'm not sure what losing a scout has to do with Babcock. His involvement with scouts would be minimal at best. Shanahan would be the one who poached him, but I think it has more to do with him getting a promotion he was never going to get in Detroit. The Wings have Hakan as their director of European Scouting and I'm sure Shanahan was well aware that Vuori has spent the past few years learning from him. Who better to choose to become your own director of European Scouting? Negativity and Pulkamania, 2 things that don't go together brother. NHL...Whatcha gonna do when the Pulkster runs wild on you? I don't think you'd shed any tears if the team lost Franzen for nothing. Sometimes its easy to forget that while Dan Cleary the player has long since outlived his usefulness as a Detroit Red Wing, that Dan Cleary the man is actually a great person and a wonderful ambassador for not just the Red Wings but professional athletes in general. That story above my post is a good reminder of that. In no way do I want him taking a roster spot up on the team anymore, but I'll always respect how he turned his career around with the Wings and his contributions to the team over the years.